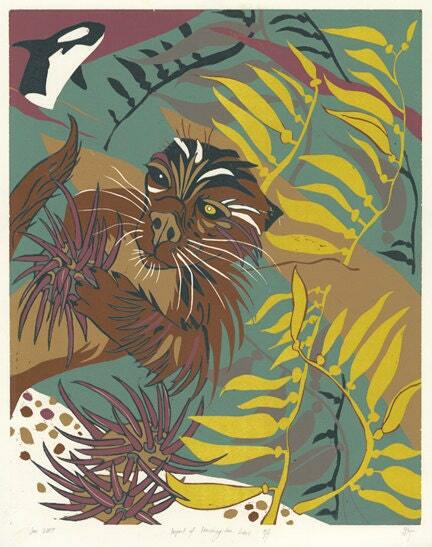 This woodcut is about Sea Otters but I am also going to tell you a little bit about Sea Lions. They are kind of like a barometer for the environment. They have been disappearing in large numbers off the western coast of the United States. An example of the interconnectedness of the world, because of the sea lions disappearing, killer whales no longer have a large supply of food so they have been eating more sea otters, sea otters keep the sea urchin population in check so with fewer sea otters there are more sea urchins, sea urchins eat kelp so without sea otters to eat them, they have been consuming swaths of kelp gardens and threatening fish nurseries.